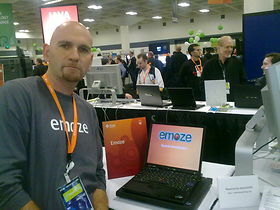 JavaOne Conference, San Francisco, 2 June 2009 – Emoze, the global leader in push technology for mobile, will be presenting its Java technology- based mobile client developed using the new Light Weight User Interface Toolkit (LWUIT) from Sun Microsystems at the 2009 JavaOne conference in San Francisco, 2-5 June. Emoze is the first company to use the LWUIT technology in a commercial push email solution. emoze Java Platform Micro Edition (Java ME) based client was successfully launched with several mobile carriers worldwide and with several leading handset manufacturers such as Samsung and Nokia. emoze will be one of the few firms invited by Sun to showcase the applications developed using Sun Microsystems technologies at the prestigious JavaOne conference.